The report below was originally published by the Ukrainian association Liva Opozytsiya – Left Opposition the moves against free trade unions in these areas of Donbas are a matter of concern for the international labour movement. The Confederation of Free Trade Unions is no longer able to function in these areas, and independent trade unions are being declared illegal. The Federation of Trade Unions of the “DNR” (Donetsk People’s Republic) http://www.osps.dn.ua/was formed this weekend amidst all the pomp and circumstance reminiscent of the era of stagnation (the Brezhnev years – MB). Of course, at the core of this rotten formation are the bureaucrats of the Federation of Trade Unions of Ukraine (FPU). 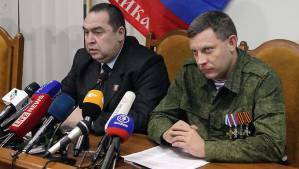 Loyal to the Ukrainian oligarchs the FPU has agreed to be their instrument of control over the workers in the territories seized by the separatists. So now we can stop thinking about the development of an independent trade union movement in these “people’s” republics. The Independent Miners Union at the Barakov mine has already come up against the force of the Instruction “about the prohibition of registration of independent unions” (http://npg.social/title/275/). The draft Law of the “DNR” entitled “On trade unions, their rights and guaranteed activities” contains obstacles in the way of independent trade unions: it is forbidden to form a trade union if it has less than 50 members. Apart from that, there is no recognition that a trade union becomes one from the moment its statutes are adopted. Freedom of expression is restricted: according to the “DNR” law any mass media outlet can have its license withdrawn for mentioning a “prohibited” organisation. One needs to get state registration in order to distribute a newspaper with a print run of more than 100 (one hundred) copies. Protests in the “DNR” are criminalised: its criminal code punishes slander and insult of government officials. There is a “Labour Code” being prepared in the DNR which has a clearly pro-capitalist character (http://lug-rescomroo.info/?p=277). Under its demagogy about “a republic without oligarchs” a criminal regime is being formed which not only violates the right to work, but excludes the very possibility of struggle for the rights of labour.